The cottages were opened by Baroness Masham of Ilton, who uses a wheelchair herself, and a noted champion of the disabled in the House of Lords. All five cottages have all been awarded ETB 5 Star, but three have been specifically designed for wheelchair users. These are all detached properties with their own private patio gardens. Chestnut Cottage is for four people, Cat M2, Oak House is for 10 people Cat M2, Home Cottage is for six people Cat M3I. The cottages are situated in idyllic surroundings within 600 acres of beautiful and peaceful Warwickshire farmland in the historic village of Knightcote. The area around the cottages, including the adjacent parking, is totally level and smooth, constructed of tarmac or brick paving. 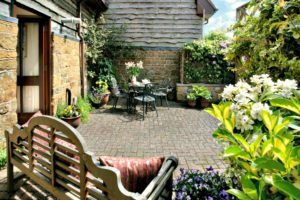 The private patio gardens are very spacious and attractively paved with high quality metal or wood furniture and gas barbecues. The gardens have been designed and planted to provide stimulating plants for smell, touch and colour throughout the year. Our impressive collection of rare vintage tractors, model boat club, model railway exhibition and club, tranquil carp lake are all accessible and situated near to the cottages. 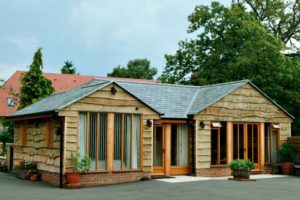 This bungalow cottage is designed for the independent traveller who is in a wheelchair, all bedrooms and bathrooms are accessible. There are no ramps or steps to the property. The doorway is level and is 93cm wide and has a handrail to the left hand side of the entrance door. All internal doors are hand crafted solid ash and 90cm wide. The door handles and large light switches (height 98 cm) are all at an accessible height. All taps are lever controlled. Windows are opened by a one-hand operation at an accessible height. There is ample space for wheelchairs to manoeuvre all around the cottage. Lounge: There are two high backed leather sofas offering good lumber support and two smaller tub chairs. The Colour TV, DVD and video recorder which are all remote controlled. Dining: The oval dining table (height 77 cm) made of handcrafted ash is a bespoke design crafted with a centre support leg to be very sturdy but offer unobstructed room for six people in wheel chair or on the chairs provided. One of the six chairs is a carver chair with arms. Kitchen: is made from hand crafted solid Ash and is extremely well equipped, with oven hinged to the left, oven/microwave, hob, fridge, freezer, dishwasher and washer/dryer. There is also a variable height workstation, which contains the hob, the sink and a working surface. This is easily adjusted to be able to accommodate different working heights from 85 cm – 91cm. Bedrooms: There is ample room to manoeuvre a wheelchair in every bedroom. There are two twin rooms and a double room. The bed (height 55 cm) in double bedroom and the beds (height 57cm) in both twin bedrooms are made of heavy country pine with pocket sprung mattresses, with plenty of space to get a hoist underneath. There is a TV in each room with remote control. The wardrobes are large and unrestricted at the bottom to allow free wheelchair access into them. Ensuite. (off the twin bedroom) The shower is thermostatically controlled and has a wheel in shower with grab rails for assistance. The toilet (height 41cm) allows front and left hand side transfer access, with rails for assistance. Also have a 10 cm toilet seat riser. The washbasin (height 71cm) allows easy wheelchair access with mirror above. Main bathroom. Has a bath with rails for assess, There is a separate thermostatically controlled wheel in shower and shower stool or wheelie shower chair if required. The toilet (height 47cm) is positioned perfectly to facilitate transfer from, front, left and right hand side transfer side plus drop down rails each side for assistance. Wall mounted basin, with unobstructed space underneath and mirror above. This house has one downstairs twin bedroom with ensuite shower room and toilet which is suitable for people who are in a wheelchair some or all of the time but have the assistance from other people to do tasks like cooking. The other 4 bedrooms are upstairs and not accessible. There are no ramps or steps to the property. The doorway is level and is 89cm wide. Oak House has one downstairs accessible twin bedroom with ensuite shower room, with accessible sitting room kitchen and dining room. All the internal doors in these rooms are hand crafted solid oak and 81 ½ cm wide. The door handles and light switches (height 110cm) are all at an accessible height. All taps are lever controlled. There is more than ample space for wheelchairs to manoeuvre. Also there is a further cloakroom with toilet (height 43cm) and a sink downstairs. Upstairs there is one twin room with ensuite, a double bedroom with ensuite and two further twin rooms with separate bathroom and shower cubicle that are not accessible to wheelchairs. The carpeted stairs are easy to climb and have a very solid handrail on the right hand side. Lounge: All sofas are high backed and have good lumber support with a separate tub chair. There is a colour TV, DVD and video recorder which are all remote controlled. Kitchen: is made from hand crafted solid Oak and is extremely well equipped, two ovens with one hinged right and one hinged to the left, microwave, hob, large American type fridge and freezer, dishwasher and washer machine and tumble dryer. Height of work surface 92cm. Dining: The long dining table with rounded ends (height 72 cm) made of handcrafted oak is a bespoke design crafted with a three centre support legs to be very sturdy but offer unobstructed room for 12-14 people in wheel chairs or on the chairs provided. Two of the 12 chairs are carver chair with arms. Bedroom: There is ample room to manoeuvre a wheelchair in the downstairs bedroom. The beds (height 56cm) are made of heavy country pine with pocket sprung mattresses. There is plenty of space to get a hoist underneath. There is a TV in each room with remote control. Bathroom: private ensuite shower room, with wheel in shower, thermostatically controlled with grab rails for assistance. A toilet allowing front and right hand side transfer access, with rails for assistance and wall mounted basin (height 81cm) allowing unobstructed wheelchair access with mirror above. This bungalow cottage has one twin bedroom and shower room which is suitable for people who are in a wheelchair some or all of the time but do have the assistance from other people to do tasks like cooking. There is a further double bedroom and ensuite small bathroom that is not accessible. There are no ramps or steps to the property. The doorway is level and is 85cm wide. There is one accessible twin bedroom with private/ensuite shower room and toilet, with accessible sitting room kitchen and dining room. All the internal doors in these rooms are hand crafted solid ash and 82 ½ cm wide. The door handles and large light switches (height 104cm) are all at an accessible height. All taps are lever controlled. There is ample space for wheelchairs to manoeuvre. There is also another ground floor double bedroom with ensuite bathroom with toilet, small bath and overhead shower but this is not accessible in a wheelchair. Lounge: Both the sofas are high backed and offer good lumber support. There is a colour TV and DVD both of which are remote controlled. Dining: The oval dining table (height 75 cm) made of handcrafted ash is a bespoke design crafted with a centre support leg to be very sturdy but offer unobstructed room for six people in wheel chairs or on the chairs provided. Two of the six chairs are carver chairs with arms. Twin Bedroom: There is ample room to manoeuvre a wheelchair in the downstairs bedroom. The beds (height 48cm) are made of heavy country pine with pocket sprung mattresses. There is plenty of space to get a hoist underneath. There is a TV with a remote control. Bathroom Private/ensuite shower room: with wheel in shower, thermostatically controlled with grab rails for assistance. 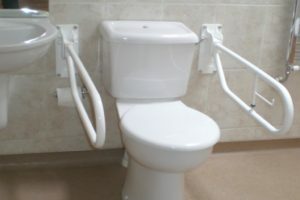 A toilet (height 42 cm) allowing front and left hand side transfer access, with rails for assistance and wall mounted basin (height 81cm) allowing unobstructed wheelchair access and mirror above. The following items are available free of charge – please request these when making your booking. Please also ask for clarification if you are not sure whether these items would meet your specific requirements. Please ask about hiring hoists, electric beds, electric wheelchairs, riser and recliner chairs. We recommend Wenman Mobility, they are nearby to us and offer a fantastic service. Tel: 01926 624432 or email: info@wenmanhealthcare.co.uk.